Ronnie Stewart wants to honor the cultural legacy of West Oakland. Growing up in West Oakland in the 1950s, Ronnie Stewart would often pick up 20-cent packs of Camel cigarettes for his mother. At age seven, he enjoyed going to Pearl Harbor Liquor, a store on 7th and Adeline streets with a bar in the back and jukebox that always had the newest records. There, he would regularly see Lowell Fulson, the influential West Coast blues guitarist and vocalist, buy a drink before a show at the Slim Jenkins Supper Club down the street. "Supper clubs, bars, hole-in-the walls — 7th Street offered a variety of entertainment," Stewart, now 65 years old, recalled on a recent afternoon, standing by the West Oakland BART station, just a few blocks away from his childhood home. "It was the Harlem of the West Coast," he said, rattling off names of his favorite jazz and blues venues and clubs that once defined 7th Street. For decades, Stewart, executive director of the West Coast Blues Society, has fought to preserve and honor the blues legacy of 7th Street, after a series of government construction projects — the Cypress Freeway, the US Post Office, and the elevated BART tracks — destroyed the neighborhood and its cultural institutions. Honoring this past is especially critical now, longtime blues musicians say, given that the city is moving forward with major real estate development projects following the Oakland City Council's passage last summer of the controversial West Oakland Specific Plan (WOSP) (See "The Fight to Develop West Oakland," 7/9/14). The WOSP establishes detailed development guidelines for roughly 1,400 acres of West Oakland with the goal of bringing high-density residential and commercial projects to vacant and underutilized properties near BART — including on lots once home to popular clubs and dance halls. The plan identifies 7th Street as one of four so-called "opportunity areas" with a call for housing, retail, and projects that "revitalize 7th Street as a celebration of West Oakland's cultural history of music, art, and entertainment." 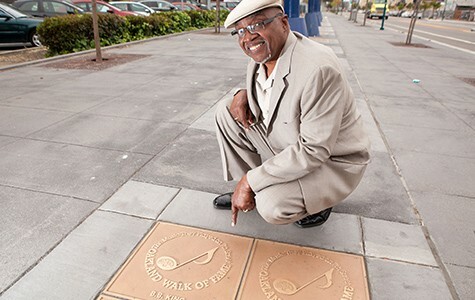 Last month, city leaders and the West Coast Blues Society (also called the Bay Area Blues Society) unveiled a "Blues Walk of Fame" called "The Music They Played on 7th Street Oakland," in front of the BART station. The walk features 88 sidewalk plaques honoring the world-famous musicians who played in West Oakland — like Aretha Franklin, Etta James, Nat King Cole, and Billie Holiday — along with many artists who aren't nationally recognized but are local legends. Though the completed tribute is a huge feat for Stewart and other musicians — they have advocated for a blues walk for more than two decades, during which time more than fifteen of the honorees have died — the installation is meager relative to the size of the once-thriving entertainment district it celebrates. Stewart said that, before the post office and BART took over, there were dance halls, music venues, and restaurants on every block of 7th Street between Adeline Street and the former Oakland Army Base. In addition to Slim Jenkins, there was Esther's Orbit Room (the longest running club on the street), the Kit Kat Club, House of Joy Tavern, the Lincoln Theatre, John Singer's club and restaurant, the Creole Café, and many other Black-owned venues and businesses. And beyond the celebrity musicians that played on 7th, Stewart said it was critical to honor musicians like Jay Payton, Lafayette "The Thing" Thomas, Dell and Tippie (the house band for Slim Jenkins), Trudy Johnson, and "Terrible Tom" Bowden — locally influential artists whose names are largely forgotten today. 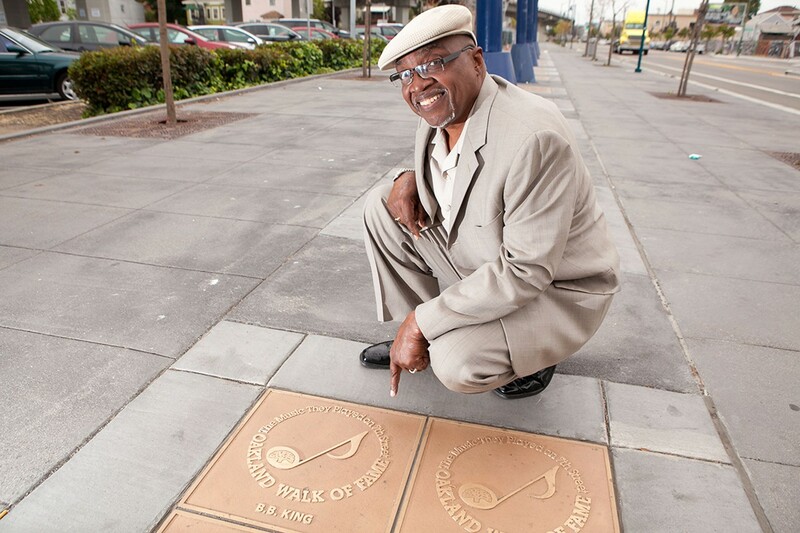 "So many famous people came here, and I got to be around all the greats," said Bowden, a 76-year-old blues musician and Walk of Fame honoree, who still lives in West Oakland. Standing above a Walk of Fame gold plaque that invites passersby to celebrate the "glorious era in Oakland's musical history," Stewart said he has more ambitious plans to honor the cultural history of the neighborhood. "We have to perpetuate this art form that's indigenous to not only African Americans but indigenous to 7th Street." Stewart said he hopes to launch a regular concert series on 7th Street with individual shows dedicated to each of the 88 honorees. He said he's also seeking funding for a local West Coast Blues Hall of Fame center that would function as a music venue and feature a wide range of artifacts and memorabilia. Meanwhile, the fate of the last remaining vestiges of the historic entertainment district remains uncertain under the WOSP. (There's not much left, given that the urban infrastructure projects of the Fifties, Sixties, and Seventies decimated nearly all of the institutions). Even the iconic sign outside the shuttered Esther's venue (1724 7th Street) — which closed five years just before its namesake, Esther Mabry, the "grand dame of 7th Street" died in 2010 — recently came down. In November, a company called Myrtle Street Flats LLC (which also goes by the name Sunrise Properties) bought Esther's building and several surrounding properties from the Mabry family. The company's manager, Alan Wofsy, told me in an email that his firm renovates historic properties and is in contact with "many people in the music world, some of whom would like to re-establish Esther's ... as a music and food venue." Wofsy said that 1720 7th Street, a site next door that formerly housed a venue called Singer's Arcade, is also on the market. Both properties have second-floor residential spaces and could be set up as live-work buildings, he said, adding that one interested party wants to provide housing for visiting musicians. It remains to be seen what will happen at some of the other 7th Street sites that once housed entertainment venues. There are many vacant lots the city has identified for development in the WOSP, such as on 7th between Peralta and Campbell streets, which was once home to the Lincoln Theatre, a historic venue that was demolished in 2003. But Rachel Flynn, director of the city's planning and building department, said that the city has not yet received any specific projects proposals on 7th Street — though there are multiple housing projects in the works just north on Wood Street. Jabari Herbert, developer with the West Oakland Development Group, is also in the very preliminary stages of proposing a mixed-use project around the BART station just south of 7th Street that could include more than five hundred residential units, parking, ground-floor commercial space, and other uses. He said that honoring the artistic legacy of the district will be a "theme in all phases of the project," adding, "We'll make sure it pays homage to ... the historic cultural element of 7th Street." Bowden said he welcomes redevelopment in the area — but that, above all, he would love to see a successful club open on 7th Street. He said he also hopes that local musicians can produce some kind of "7th Street Blues Festival" in the future. The theme, he said, could be "gone, but not forgotten."